The Big Bang theory is the prevailing cosmological model for the early development of the universe. According to the theory, the Big Bang occurred approximately 13.798 ± 0.037 billion years ago, which is thus considered the age of the universe.At this time, the universe was in an extremely hot and dense state and began expanding rapidly. After the initial expansion, the universe cooled sufficiently to allow energy to be converted into various subatomic particles, including protons, neutrons, and electrons. Though simple atomic nuclei formed within the first three minutes after the Big Bang, thousands of years passed before the first electrically neutral atoms formed. 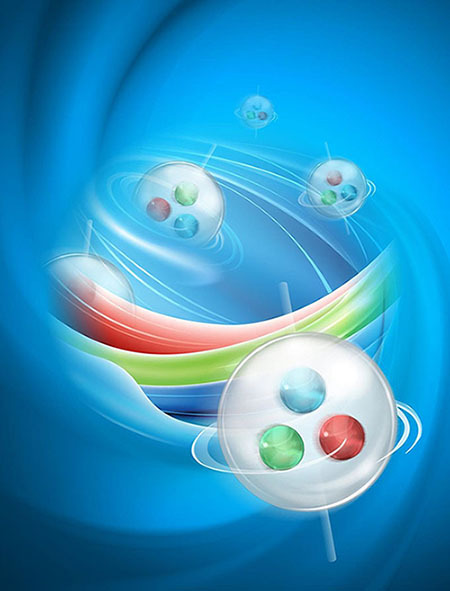 The majority of atoms that were produced by the Big Bang are hydrogen, along with helium and traces of lithium. Giant clouds of these primordial elements later coalesced through gravity to form stars and galaxies, and the heavier elements were synthesized either within stars or during supernovae. The Big Bang is the scientific theory that is most consistent with observations of the past and present states of the universe, and it is widely accepted within the scientific community. It offers a comprehensive explanation for a broad range of observed phenomena, including the abundance of light elements, the cosmic microwave background, large scale structure, and the Hubble diagram. The core ideas of the Big Bang - the expansion, the early hot state, the formation of light elements, and the formation of galaxiesÑare derived from these and other observations. As the distance between galaxies increases today, in the past galaxies were closer together. The consequence of this is that the characteristics of the universe can be calculated in detail back in time to extreme densities and temperatures, while large particle accelerators replicate such conditions, resulting in confirmation and refinement of the details of the Big Bang model. 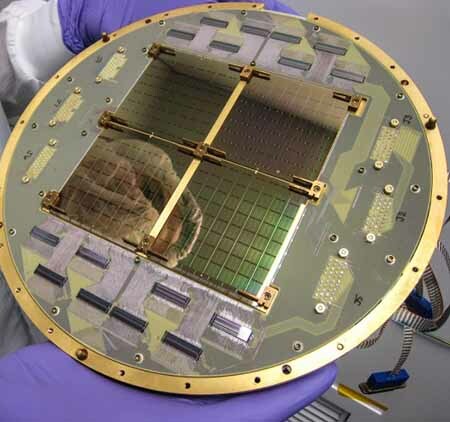 On the other hand, these accelerators can only probe so far into high energy regimes, and astronomers are prevented from seeing the absolute earliest moments in the universe by various cosmological horizons. 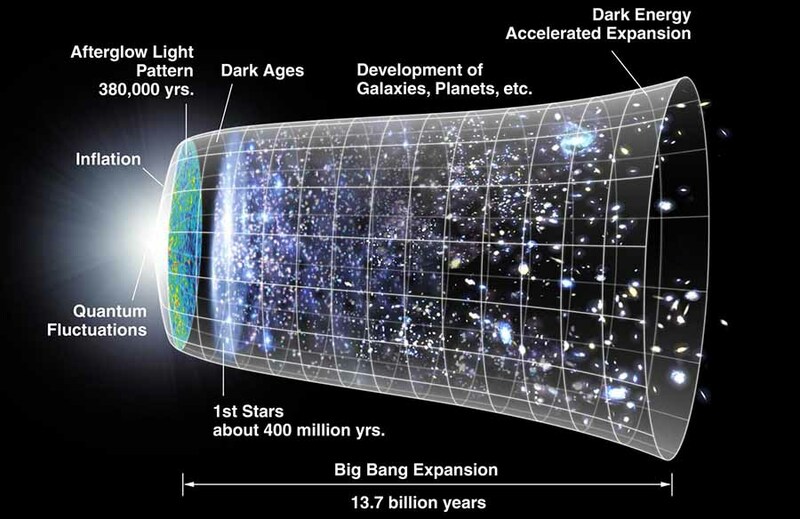 The earliest instant of the Big Bang expansion is still an area of open investigation. The Big Bang theory does not provide any explanation for the initial conditions of the universe; rather, it describes and explains the general evolution of the universe going forward from that point on. Georges Lema”tre first proposed what became the Big Bang theory in what he called his "hypothesis of the primeval atom". Over time, scientists built on his initial ideas to form the modern synthesis. The framework for the Big Bang model relies on Albert Einstein's general relativity and on simplifying assumptions such as homogeneity and isotropy of space. The governing equations were first formulated by Alexander Friedmann and similar solutions were worked on by Willem de Sitter. In 1929, Edwin Hubble discovered that the distances to far away galaxies were strongly correlated with their redshifts - an idea originally suggested by Lema”tre in 1927. Hubble's observation was taken to indicate that all very distant galaxies and clusters have an apparent velocity directly away from our vantage point: the farther away, the higher the apparent velocity, regardless of direction. Assuming that we are not at the center of a giant explosion, the only remaining interpretation is that all observable regions of the universe are receding from each other. A relic cloud of gas, orphaned after the Big Bang, has been discovered in the distant universe by astronomers using the world's most powerful optical telescope, the W. M. Keck Observatory on Maunakea, Hawaii. The discovery of such a rare fossil offers new information about how the first galaxies in the universe formed. The quasar, which emits a bright glow of material falling into a supermassive black hole, provides a light source against which the spectral shadows of the hydrogen in the gas cloud can be seen. BR> The Big Bang has captured our imagination like no other theory in science: the magnificent, explosive birth of our Universe. But do you know what came next? Code was created which allowed formation of the first stars in the universe to be modeled. These equations describe the movement and chemical reactions inside gas clouds in a universe before light, and the immense gravitational pull of a much larger but invisible mass of mysterious dark matter. Our universe may end the same way it was created: with a big, sudden bang. 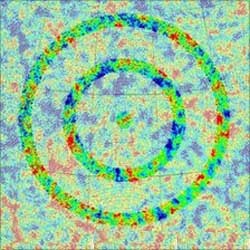 That's according to new research from a group of Harvard physicists, who found that the destabilization of the Higgs boson - a tiny quantum particle that gives other particles mass - could lead to an explosion of energy that would consume everything in the known universe and upend the laws of physics and chemistry. At the time of the Big Bang 13.8 billion years, all matter in the universe erupted from a singularity to create the cosmos that we know today. What happened before the Big Bang? Professor Stephen Hawking says time existed in a 'bent state' that was distorted along another dimension. Big Bang was the formation of what we now regard as time because the event broke down the laws of physics. This means that anything that preceded it cannot be applied to our understanding of time and existence. 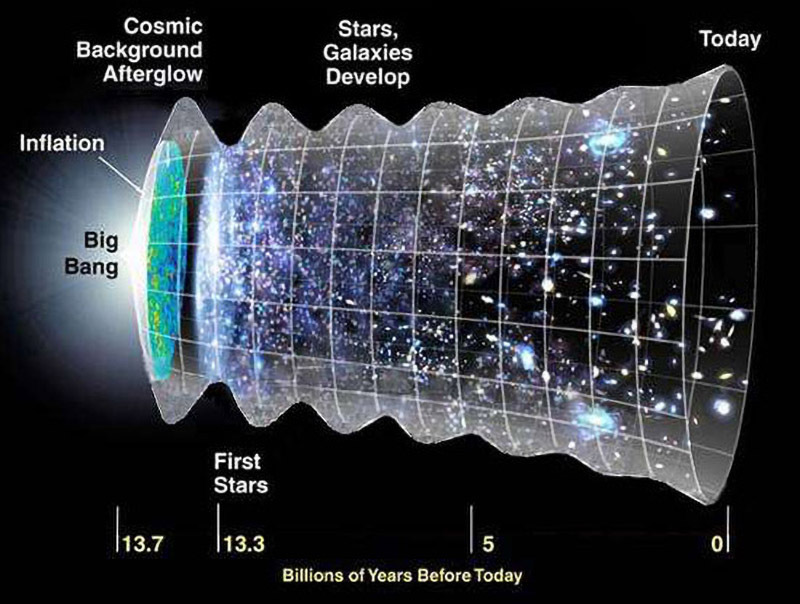 Essentially, there was no conceivable 'boundary' of time until the Big Bang. According to this theory, the history of the universe is not a flat line but a four-dimensional, curved object, 'like the surface of the Earth, but with two more dimensions', Hawking said. Faster than a tornado, speedier than the giant storm swirling on Jupiter - it's the world's fastest-swirling vortex, which scientists have created in a primordial soup of gluey particles meant to re-create the Big Bang. The swirling particle soup rotates at head-snapping speeds - many times faster than the closest contenders. However, don't expect this fast-spinning fluid to turn heads anytime soon, as the vortices occur in a material called a quark-gluon plasma that is so small that the signature of this whirling can be detected only by the particles it produces. The physics world was on fire yesterday after an announcement that astronomers had detected a signal from the beginning of time. This is exactly as cool as it sounds. Maybe even cooler. And it might lead to us learning further crazy things about our universe. Besides coming as a shock to most of the community, the discovery once again proved that we don't quite know many things about our universe. Ordinarily sober-minded scientists went to hyperbolic lengths to describe just how significant the results were. Depending on who you ask, they were as important as finding the Higgs boson, directly detecting dark matter, or discovering life on other planets. Scientists say they have extraordinary new evidence to support a Big Bang Theory for the origin of the Universe. Researchers believe they have found the signal left in the sky by the super-rapid expansion of space that must have occurred just fractions of a second after everything came into being. It takes the form of a distinctive twist in the oldest light detectable with telescopes. The breakthrough was announced by an American team working on a project known as BICEP2. Japanese physicists have created a string theory model that simulates the birth of the universe. In their model, the Big Bang was a "symmetry-breaking event" - a fluctuation that caused three spatial dimensions to break free from the other six dimensions of string theory, then rapidly unfurl to produce our universe's observed 3D structure. String theory - a proposed "theory of everything" that unites quantum mechanics and general relativity together in one complete picture - models elementary particles as oscillating lines ("strings") rather than dimensionless points. 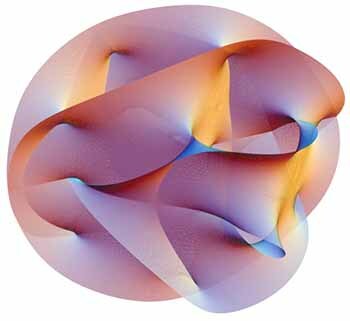 In order for the math to work, string theory requires that there be 10 dimensions: nine of space and one of time. 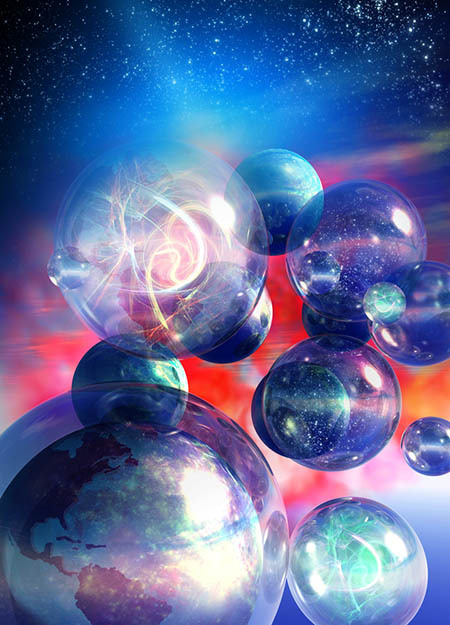 Our universe only appears to have three spatial dimensions, string theorists say, because the other six are curled up in undetectably tiny bundles called Calabi-Yau manifolds, which are a minuscule 10^-33 centimeters across. 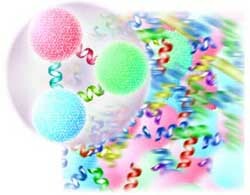 A trio of Japanese physicists have applied a reformulation of string theory, called IIB, whereby matrices are used to describe the properties of the physical universe, on a supercomputer, to effectively show that the universe spontaneously ballooned in three directions, leaving the other six dimensions tightly wrapped, as string theory has predicted all along. 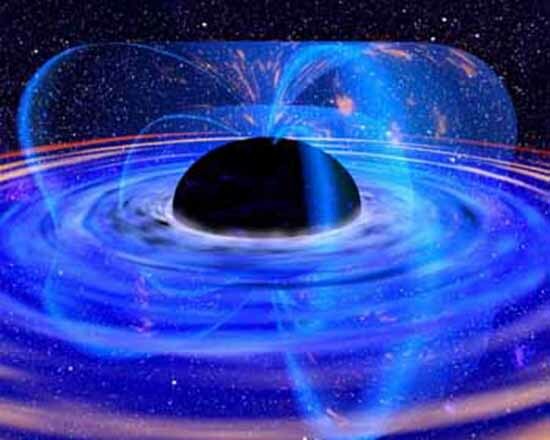 Suppose at some point the universe ceases to expand, and instead begins collapsing in on itself (as in the ÒBig CrunchÓ scenario), and eventually becomes a supermassive black hole. 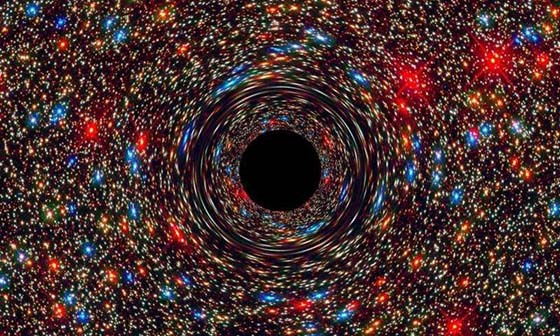 The black holeÕs extreme mass produces an extremely strong gravitational field. Through a gravitational version of the so-called Schwinger mechanism, this gravitational field converts virtual particle-antiparticle pairs from the surrounding quantum vacuum into real particle-antiparticle pairs. If the black hole is made from matter (antimatter), it could violently repel billions and billions of antiparticles (particles) out into space in a fraction of a second, creating an ejection event that would look quite similar to a Big Bang. By creating a soup of subatomic particles similar to what the Big Bang produced, scientists have discovered the temperature boundary where ordinary matter dissolves. Normal atoms will be converted into another state of matter - a plasma of quarks and gluons - at a temperature about 125,000 times hotter than the center of the sun, physicists said after smashing the nuclei of gold atoms together and measuring the results. While this extreme state of matter is far from anything that occurs naturally on Earth, scientists think the whole universe consisted of a similar soup for a few microseconds after the Big Bang about 13.7 billion years ago. The telescope was sent 0.9 million miles (1.5 million km) into space by the European Space Agency earlier this year to look at the age, contents and evolution of the cosmos. Now the first images have come back showing strips of ancient light across the sky. It will take two years for scientists to analyze the images and begin to interpret what it tells us about the beginning of the universe. The telescope is looking at the heat left by the Big Bang millions of years ago known as Cosmic Microwave Background radiation (CMB). 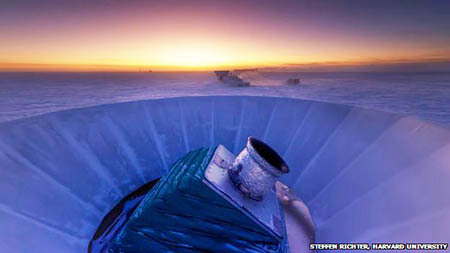 A Nasa space probe measuring the oldest light in the Universe has found that cosmic neutrinos made up 10% of matter shortly after the Big Bang. Five years of study data also shows that the first stars took over half a billion years to light up the Universe. 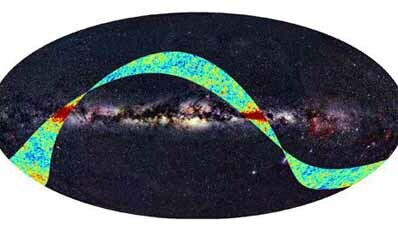 WMAP launched in 2001 on a mission to measure remnants of light left over from the Big Bang. Scientists say it is collecting a "treasure trove" of information about the Universe's age, make-up and fate. 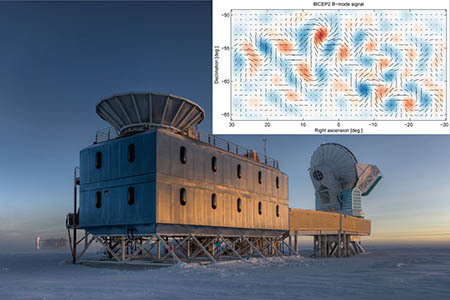 The Wilkinson Microwave Anisotropy probe (WMAP) is mapping the Cosmic Microwave Background (CMB) radiation in the sky. 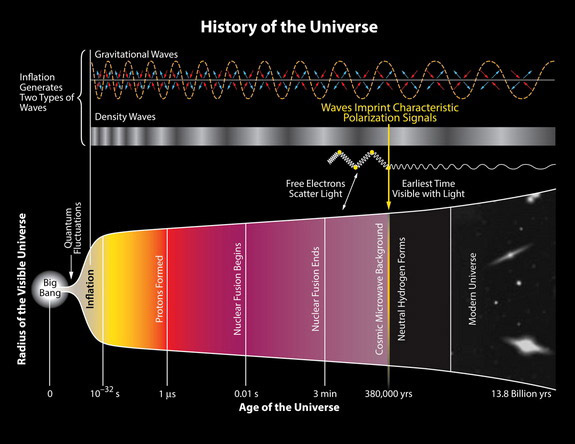 This is the oldest light in the Universe, shifted to microwave wavelengths as the Universe expanded over 13.7 billion years. Though Einstein's theory of general relativity does an excellent job of describing the universe almost back to its beginning, near the Big Bang matter becomes so dense that relativity breaks down. Beyond that point, we need to apply quantum tools that were not available to Einstein. Now Ashtekar and two of his post-doctoral researchers, Tomasz Pawlowski and Parmpreet Singh, have done just that. Using a theory called loop quantum gravity, they have developed a mathematical model that skates right up to the Big Bang -- and steps through it. 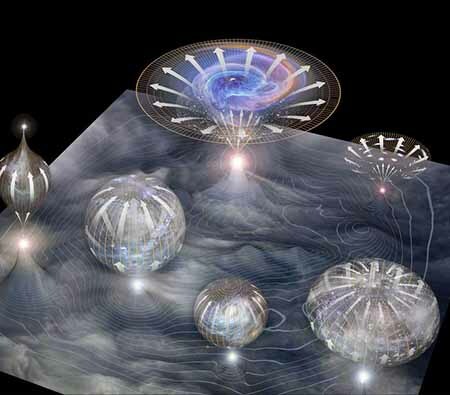 On the other side, Ashtekar says, exists another universe with space-time geometry similar to our own, except that instead of expanding, it is shrinking. "In place of a classical Big Bang, there is in fact a quantum Bounce," he says.